Let’s talk about how area rugs can Creatively Transform any room in your home. Most of our homes on Long Island feature hardwood or tile flooring. While beautiful, they typically remove the warmth from the room. An area rug adds sophistication and comfort to any living space plus stylish decor. There are some important rules to remember. Before buying, check out these area rug do’s and don’ts. When selecting an area rug, make sure that it extends under all the key pieces of furniture in the room. In a living room, for instance, all of the furniture should be on top of the rug. If this isn’t possible, it’s okay to have the front legs of major upholstered pieces on the rug and the back legs off. However, all the legs of smaller pieces should be on the rug. In a dining room, the rug should be large enough for the chairs as well as the table. A good rule to follow is that the chairs should be on the rug, even when they’re pulled out from the table. The number one mistake people make when decorating with area rugs is getting ones that are too small. Ideally, you should leave the same amount of floor space on all sides of your rug. Give yourself anywhere from about eight to 24 inches on all sides. Eighteen inches is the most common space, but in a smaller space, you can get away with as little as eight inches. The main goal is to have the rug centered in the room. What good is an area rug if it doesn’t extend beyond the bed? Be sure to get your measurements right before you go shopping. The rug should be large enough to extend beyond the sides of the bed at least 12 inches for a twin or double bed, and at least 18 inches for a queen or king. You can go bigger, but these numbers should be the minimums you want to look for. Make sure that any heavily trafficked areas are fully covered by the rug you choose. When people are walking through, they shouldn’t have one foot on the rug and one foot off. It’s awkward, uncomfortable, and can lead to unusual wear patterns on both the rug and your flooring. Area rugs are a great way to inject playfulness and fun into the room, so embrace color and pattern while shopping. There are many inexpensive options available, so if you decide you don’t like it after a couple of years, it’s easy to change. Be sure to check the cleaning instructions on any rug before you buy it. There is a new solution to keeping area rugs clean. Ruggable is a two-piece rug system that enables you to machine wash your area rug or runner. They offer sizes from 2×3′ up to 8×10′. They have interchangeable covers that are stain-resistant and waterproof with a cushioned, non-slip rug pad. It is so easy to remove the cover, throw it in the wash and reattach. This is a practical way to add fashion and function to any room or hallway in your home. Love the home you live in is our motto. Call today for a color consultation to Creatively Transform your home for Spring. The color is a trendsetter whose influences can be seen in fields from home decor, accessories to fashion and beauty products. This is a bright color, although softer than corals of the past there are ways to use it. You can Creatively Transform your home with this color as an accent with accessories or furniture. Small touches can make a big statement. A blanket or cashmere throw is one of the easiest ways to bring the color in. It is also a functional accessory in January on either a sofa or at the end of the bed. Adding a throw pillow is easy, practical, and if you can find a pillowcase in your desired color, it’s extremely affordable! Pick up a bundle of your favorite coral flowers as a centerpiece for any room. Living Coral can change the feeling of a space. It will add a dramatic pop of color wherever it is used. And remember to love the home you live in! The holidays are upon us. What kind of guest room accommodations do you have? Is it a sofa bed in a spare bedroom, air mattress in the basement, futon in the home office or some other kind of setup? Will your overnight guests feel like they are on a true vacation? We have some easy ways to Creatively Transform a guest room into a retreat. Sofa beds of yesteryear had thin mattresses and the painful bars in your back. Fortunately, they have been improved over the years with memory foam mattresses. A mattress topper can add more comfort to any bed. Depending on the thickness, it might have to be removed to fold the bed up. A minor inconvenience for a restful night’s sleep for your guests. A beautiful comforter set can make any room feel cozier. Throw pillows on an air mattress will just give the bed a more inviting look for guests. Send your guests to slumber land with sweet dreams by putting chocolates on their pillows. Pillows can make or break a good night’s sleep. Pillows are sold at great prices in Costco or a visit to Kohl’s or Bed Bath & Beyond with a coupon. Know if your guests have allergies as down can be irritating. Plush spa bathrobes make any stay memorable. Make a fluffy robe part of the holiday gift for your guests. Hang up with a gift tag or simply fold with a beautiful ribbon. Take a look at this budget friendly attic refresh that we did just a few weeks before Christmas. Decorate your home with holiday cards. Wrap hanging wall art in holiday wrapping paper. Then tape the cards to them. It will be a unique way to display those cards. Buy a luggage rack to make unpacking easy. I have a collection of stationery from hotels around the world that I put in the room as a fun, novel way for guests to write notes to their friends and family. Truly gives the hotel vibe. Being a good host is all about those few, important details that let guests know you’re happy they’re there and want them to be comfortable. Fresh flowers on the nightstand are another special touch. Try these ideas to elevate your guest room so they love the home they live in. Fall or the autumnal equinox officially begins on September 22nd at 9:54 P.M. Get ready for the cool mornings, budding Montauk daisies, mums making their debut and Halloween costumes and decorations. Take a cue from the changing leaves and bring these colors indoors. The changing colors of Fall create a beautiful landscape to which other seasons pale in comparison. Fall’s array of colors range from crimson to yellow, and hues often appear side by side. Applying these same colors to the interior of your home can have incredible results. The colors of fall are warm, comforting, and welcoming, making them the perfect colors for your next interior design project. The oranges, yellows, dark greens, rusts and browns of Autumn are the perfect accents for the home. Here are a few ideas to update your decor for the season. Throw pillows are an easy way to change the look of your sofa while adding comfort. Add a little fall floral with fall wreaths. Dress up your door or fireplace for the fall harvest season. Fall potpourri will have your house smelling heavenly with the delicious scents of fall! Change drapery treatments, exchanging the light, airy fabrics of spring and summer, for heavier weight, darker, richer colors for fall and winter. I do the same for bedding; in the spring and summer I like light and bright, but in the fall and winter, the darker, richer tones just make the look feel warmer and cozy. Give me the opportunity to Creatively Transform your home. Think about the serenity of a spa. Luckily for you, your bathroom offers the same type of personal area to de-stress, detoxify and unwind as professional spas. We have some easy ways to Creatively Transform your master bathroom into a private oasis. A neutral palette simplifies the environment- White or light hues of blue, green and sand offer a relaxing feel, which is why spas use this as a preferred palette. Stay away from active patterns, like checkered or stripes, since they offer the opposite effect. Hide your toiletries- Clutter tends to induce stress, so make sure you eliminate all of your unnecessary products. Spas usually keep their toiletries out of sight, so follow the same track and tuck away your products in your linen closet or under your sink. Store daily items, like Q-tips, cotton balls and makeup, in glass apothecary jars –allowing them to blend in as part of your scenery. Turn your bathing into a pampering experience- Invest in some plush towels or cozy bathrobes that are soft and absorbent. Whether you choose to start your day with a shower or end it with a purifying bath, your time spent cleansing should be a relaxing one. A simple shower head swap to a rain shower head mimics the fall of natural rain. Towel warmers gently warm bath linens quickly with affordable luxury. Designs range from freestanding plug-in units to wall-mounted wire racks. They have an added benefit of keeping damp towels from becoming mildewed. Swap fabric rugs with nature-inspired bath mats- Include an extra element of nature by adding a unique bath mat. In traditional bathrooms, people usually opt for soft rugs made of fabric. While there’s nothing wrong with this, choosing an alternative style can add a spa-like feel to the room (and omit the need for a soggy piece of fabric on the floor). Pebble bath mat: Not only does a stone-covered bath mat add a natural element of rocks to your bathroom, but its texture actually massages your sore, achy feet. Cedar wood bath mat: Cedar wood is affordable, water resistant and soft, making it great to step on. While you can’t live in a spa, you certainly can make a few changes in your home to get the same calm, relaxing feeling to love the home you live in. June is the month that we celebrate dear old dad. In honor of Father’s Day, let’s discuss Man Caves! A Man Cave is defined as a male sanctuary. Every man has a basic, primal, instinctual need to have a space to call his own. It’s his territory; a place where they can recharge their batteries after a long day on their job, and a place where they can hang out with their buddies. Man caves have multiple purposes: they are a place to be alone, to be away from women and from female sensibilities, to indulge in hobbies, and to hang out with male friends. It is, loosely, a male-only space to retreat to watch sports or play video games. In a sense, it is a way to recreate some of the space and freedom from their bachelor days since it was like a “pad” similar in feeling to a frat house game room, a college dorm or like tree houses from your childhood: no girls allowed. These traditionally male-only spaces are enhanced with improvements and masculine aesthetic choices. Man caves can be equipped with accessories such as refrigerators, putting greens, giant TVs, pool tables, and entertainment centers. A man cave may also be fitted out with a bar and sports memorabilia. These are fan caves. Transform closets of all sizes into mini man caves. 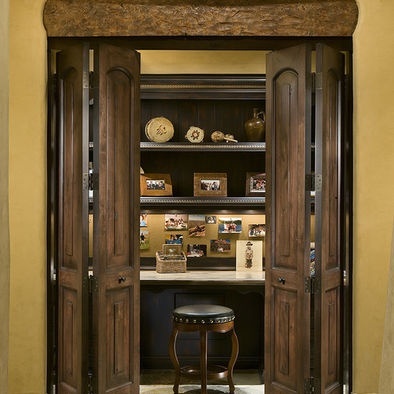 Converting men’s bedroom closets into mini man caves is a growing trend, from large walk-ins to more common sizes. Some guys create cozy reading nooks, others simply make a space to hide away with prized possessions. Even the smallest spaces can be transformed. 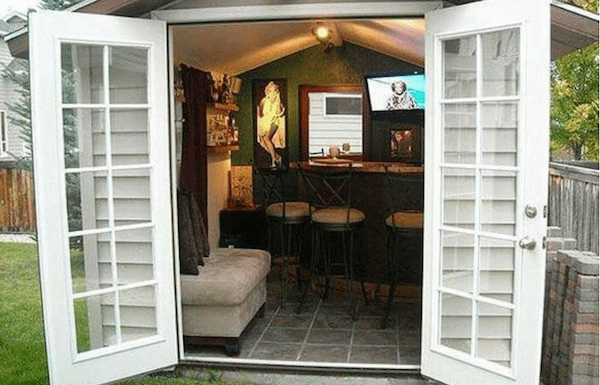 Backyard Bar Sheds are becoming quite popular. You can get as creative and elaborate as you’d like. 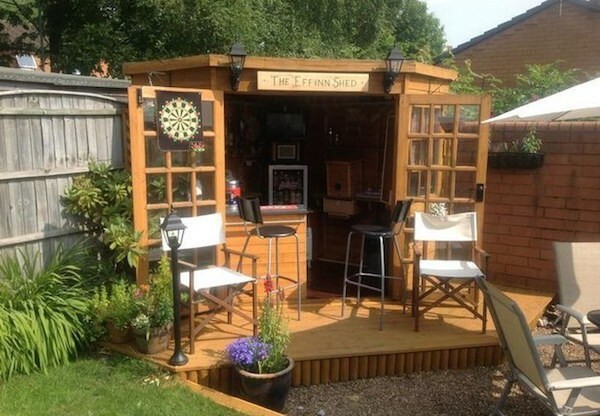 Transform your own basic shed into a mini-backyard pub that’s sure to impress. It is easy to add new doors, a bar, seating, a little porch and some fun pub games. Hide Out in the Attic. Convert unused attic space into a man cave with lots of entertainment options. Cover the ceiling with the right material to help with the acoustics. Does your Dad have a space that he Creatively Transformed? Some of the trends for the season include ice-cream pastels, glittery golds, and super zingy color pops. Bold pops of color is one of the strongest trends this season. A variety of strong shades will transform any living space and help reflect a personal style. This trend is all about mixing bright colors together. It’s strong, but easily manageable if you have one or two main colors to start with that ‘ground’ the rest of the look. Gelato colors are a huge trend in both interiors and fashion. Choosing your favorite flavor of ice cream can be a bit like choosing your favorite paint color. Introduce these pretty colors on a single wall or multiple if you feel brave, and accessorize with pastel hued vases, dining chairs and tableware. With increasing news of health benefits, the humble houseplant is fast becoming the must-have buy for our homes. And it seems the more the merrier, so pop down to your local garden center and invest in some stunning plants. Place them in each room, use hanging plants for shelves and mantelpieces and some lovely leafy beauties for bare corners and coffee/side tables. Last year the metallic trend started to filter through into paints and metal finishes, this year gold is the key color. Softer than silver, it brings its own elegance together with a sense of decadence. You’ll see gold detailing like door knobs and handles, gold lamp bases and picture frames. For a more subtle take, gold accessories are a sophisticated yet understated addition. Any of these colors can Creatively Transform a room in your home. Remember to always love the home you live in! Good luck for the year of the dog! Oriental interior decorating ideas are a modern trend. Chinese decor is appreciated for its blend of rich colors, intricate detailing and elegant simplicity. The trick to any kind of ethnic decor is in staying true to the design principles without getting carried away and straying into caricatures of the style. Red symbolizes good luck in China, so it’s never more prevalent that in the Chinese New Year. Travel with me to the Far-East for some Asian inspired decorating ideas. Sticking to simple lines and lack of clutter, enhanced by rich colors and one or two intricately carved or painted pieces is the most authentic path toward a classically beautiful Chinese room. Chinese interior decor items give rooms an Asian feel, creating comfortable and peaceful modern home interiors. Oriental interior decorating ideas, timeless Chinese interior decor items, wood furniture and decorative screens. Chinese interior decor is similarly striking. Ornate pieces are complemented by simple lines and low furniture design. The use of natural wood and traditional bamboo adds an authentic feel to oriental interior decorating. Chinese interior decor is inspiring and meaningful. We have previously discussed using bamboo. Mix traditional and Asian elements into your design scheme for an elegant yet eclectic look. Decorating can reduces Seasonal Affective Disorder. Redecorating your home can make a big difference in the quality of light there and may help contribute to improving the symptoms of seasonal affective disorder. The level of light in a room is not just determined by light through windows and skylights but also by how much is reflected by the surface of the walls and ceilings. The percentage of light which reaches a surface and is reflected back from it is called the reflectance. This percentage is higher with a white and cream walls, 60 to 70% and is much lower with darker colors which absorb available light. Pale shades will be about as effective as white and can give a room a warmer feeling. Choose lighter accessories and furniture too along with adding cool colors. Mirrors are a great addition along with lamps to brighten things up. Look around your home to invite direct sun, color and clean lines into the space. The National Institute of Health reports that natural light improves mood and energy, so open the curtains and raise the blinds. The science of using color to boost well-being, called chromotherapy, has been around for centuries and also is extremely helpful in healing depression. Take a look at your existing color palette of your home. Is it outdates, bland, or even washed out? Try introducing color by scattering candles in varied hues which will invite different colors to brighten your room. A study from Intelligent Buildings International shows that clean lines, open areas and uncluttered space promote relaxation, so try to keep your home tidy. Not only can cleaning, in itself be therapeutic, but once your home is clean, it allows you to place less worry about the organization of your space, as it will already look and feel clean and tidy. Earthy greens, soft purples, and rich blues has all been proven to enhance your space and deplete depressive states. Blue light calms the nerves and contributes to reducing depression. Red increases the potency and physical strength, while violet rejuvenates us with the help of hormones of that color, such as melatonin. Bring green plants to your environment. Gardening has been proven to be therapeutic for many individuals. Bring your plants inside for inspiration or create a garden out back and create your own tranquil space. These tips are easy to accommodate for the outcome of a less-depressing and more enjoyable home this winter. If you can dedicate a few minutes daily to them, very soon you will feel more energetic, invigorated, and happier than you’ve ever felt. The Home Decor Trend for Fall is Velvet! Long sleeves, knit sweaters, jackets and scarves: Fall fashion is all about adding layers for maximum warmth and comfort. The same goes for the home, and with pieces that are just as cozy. Let’s focus on our favorite cool-weather material—plush velvet. It is ideal for giving your home its own seasonal wardrobe update. Sofas, accent chairs, headboards—velvet furnishings come in a variety of forms, and for good reason. The material is a fail proof way to add a layer of luxury to a room (it’s long been associated with nobility), due in large part to its beautifully subtle sheen. Surprisingly versatile, velvet can lean either modern or traditional. Velvet brings a note of bold glamour to a classic space while maintaining the overall refined ambiance. Even though the fabric feels especially appropriate for fall, we say velvet, at least for the home, works in all seasons. If you’re not keen on diving headfirst into velvet, a single pillow on the bed is an easy place to try out the trend—and to instantly warm up your sleep space for the cooler months. There are thousands of great choices available here or at many local stores.